This fun value package will save you money and get you started with exciting activities for your circle time or music classroom. Includes our most popular music and movement materials. 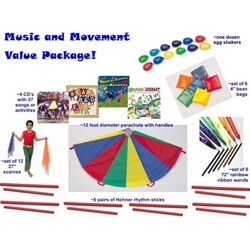 (A 12 foot parachute with handles, a set of 12 colorful scarves, a set of 6 Rainbow Ribbon wands, a set of 6 colorful 4" bean bags, 12 egg shakers and 6 pairs of rhythm sticks) Four of our most popular CD's are included which feature a total of 57 songs and/or activities to use with the props in this value package. "A World of Parachute Play" includes 15 parachute songs or activites. "Leaping Literacy" includes 16 songs or activites for Rhythm sticks or Ribbon Wands. "Musical Scarves and Activites" includes 14 songs or activities to use with scarves or other colorful materials, and "Bean Bag Fun" includes 12 songs or activities for use with bean bags. Most CD's include a guide which has lyrics and/or activity suggestions. This is an excellent starter package for your music classroom or even for family fun!